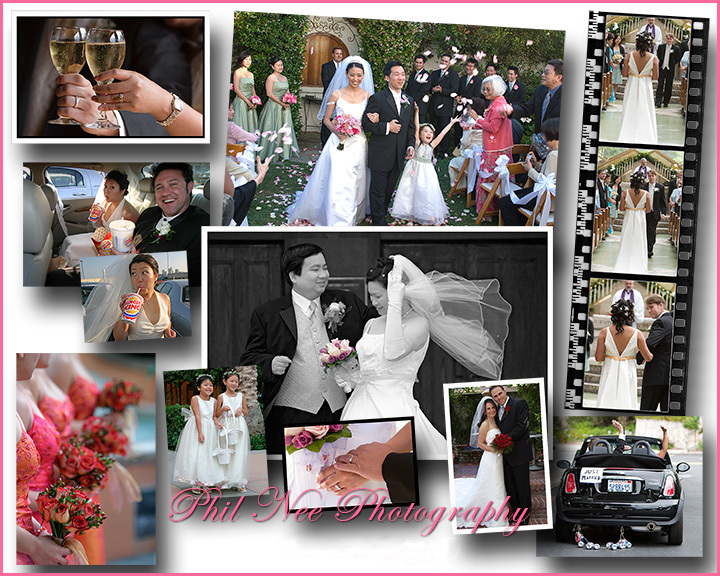 Phil Nee Photography simplifies your wedding day photography with simple rates. There is no obligation to purchase prints or custom albums. However, if that’s what you desire, I will be happy to discuss your needs and show you product samples. My photojournalistic style allows me and my associate to shoot in an unobtrusive manner, whether it’s shooting the bride or groom getting ready, or the ceremony. Of course we will also shoot family shots and bride & groom formals as desired. You always get a DVD of your images after post processing of the images using a variety of computer software. I include both hi-res files for taking to a lab of your choice; and low-res files for emailing, websites and facebook. Classic Black & White images, if you prefer, are available. If you’re taking the files to a print lab, please choose a professional lab and request “no color adjustment”. Avoid bargain drugstore printers which “auto correct” and therefore will “undo” any correction I have made on a calibrated camera and monitor. The above rates are for Manhattan only. Outside of Manhattan, travel time and transportation additional. Fee upon request. Also available for out of State and destination weddings. A non-refundable deposit of 50% is required to hold the date for you. Balance is due on or before actual wedding date. •includes DVD of images and a 18"x12" custom print in a 24"x18" mat and frame for display on wedding day.